Home » Expired Contests » Enter to Win a COMET TV and CHARGE! March Prize Pack! Enter to Win a COMET TV and CHARGE! March Prize Pack! Mind on Movies is very excited to announce that we are giving away a COMET TV and CHARGE! March Prize Pack! This month COMET TV has the best of the worst marathon, with the best of the worst movies ever created. 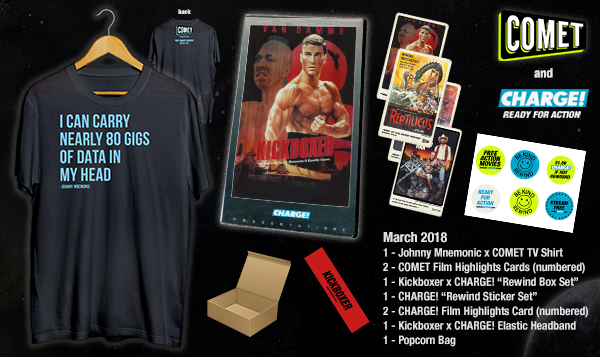 Over on CHARGE!, there’s the Kickboxer marathon with all five Kickboxer films. And we want to give you the opportunity to have an awesome March of your own! The COMET TV and CHARGE! March Prize Pack is perfect for binging some classic films and TV Shows!